The Illinois River is a principal tributary of the Mississippi River, approximately 273 miles (439 km) long, in the State of Illinois. The river drains a large section of central Illinois, with a drainage basin of 28,070 square miles. The drainage basin extends into Wisconsin and Indiana. This river was important among Native Americans and early French traders as the principal water route connecting the Great Lakes with the Mississippi. The French colonial settlements along the river formed the heart of the area known as the Illinois Country. After the construction of the Illinois and Michigan Canal and the Hennepin Canal in the 19th century, the role of the river as link between Lake Michigan and the Mississippi was extended into the era of modern industrial shipping. The Illinois River is formed by the confluence of the Kankakee River and the Des Plaines River in eastern Grundy County, approximately 10 miles (16 km) southwest of Joliet. This river flows west across northern Illinois, passing Morris and Ottawa, where it is joined by the Mazon River and Fox River. At LaSalle, the Illinois River is joined by the Vermilion River, and then it flows west past Peru, and Spring Valley. In southeastern Bureau County it turns south at an area known as the "Great Bend", flowing southwest across western Illinois, past Lacon, Henry and downtown Peoria, the chief city on the river. South of Peoria, the Illinois River is joined by the Mackinaw River and then passes through the Chautauqua National Wildlife Refuge. Across from Havana, the Illinois is joined by the Spoon River, and across from Browning, it is joined by the Sangamon River. The La Moine River flows into it approximately five miles (8 kilometers) southwest of Beardstown. Near the confluence of the Illinois with the La Moine River, it turns south, flowing roughly parallel to the Mississippi across southwestern Illinois. Macoupin Creek joins the Illinois on the border between Greene and Jersey counties, approximately 15 miles (24 km) upstream from the confluence with the Mississippi. For the last 20 miles (32 km) of its course, the Illinois is separated from the Mississippi River by only about five miles, by a peninsula of land that makes up Calhoun County. 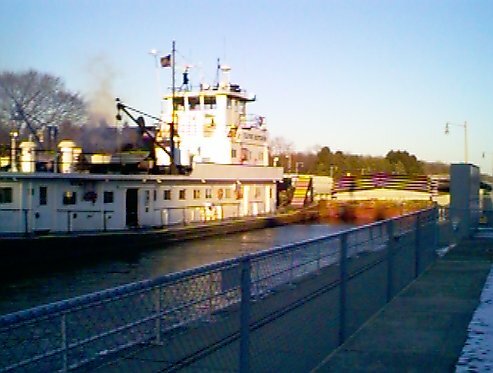 The Illinois joins the Mississippi near Grafton, approximately 25 miles (40 km) northwest of downtown St. Louis and about 20 miles upstream from the confluence of the Missouri Riverand the Mississippi. 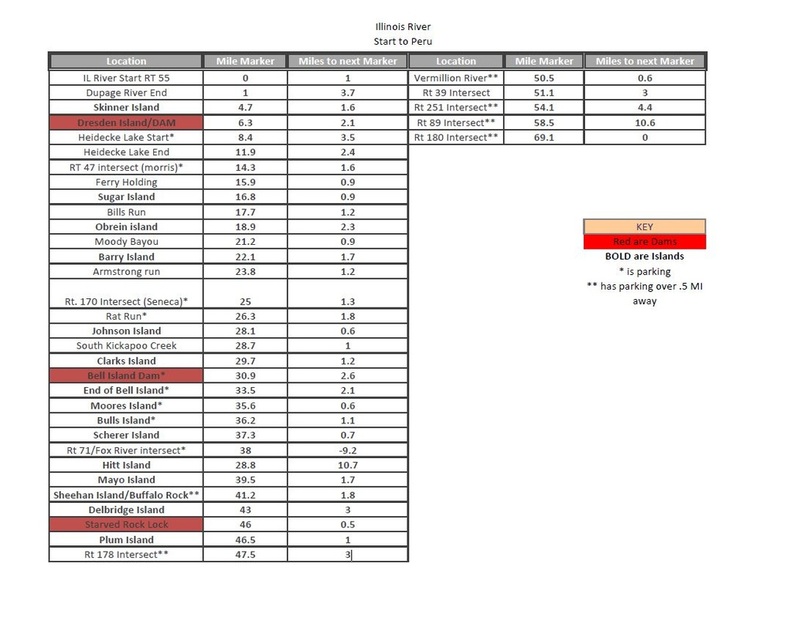 Trips down the Illinois river are fairly slow, due to the low flow of the river. The current maybe flows 1 MPH. Headwind can actually halt progress. Canoes or Kayaks on the Illinois river can be overturned too, by speedboats. Take care, and be sure to pack a good map. -The river is home to many marinas and industrial businesses, making it busy with speedboats and ferries. 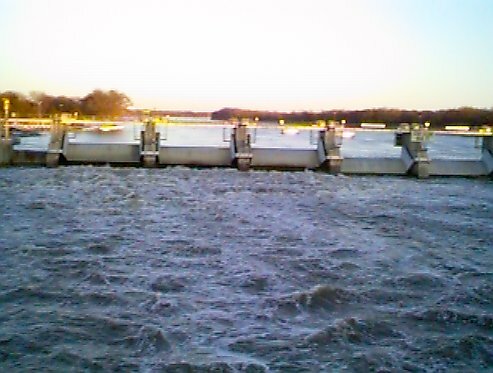 The lock is river left. An alternative to waiting for the lock is to portage river right before the dam to the I&M Canal to pass the dam. There are many places to re-enter the river, the easiest being Stratton State Park. Illini state park has an easy to spot navigation dam with tall peaked bridge just past dam. 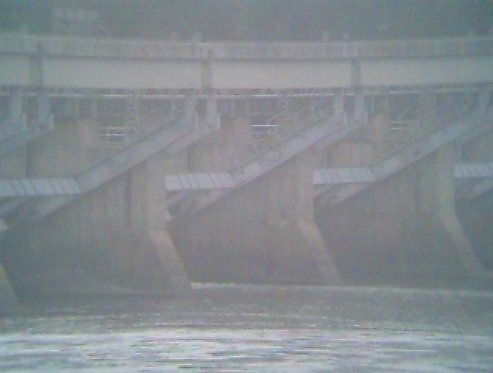 The dam is located on the main river channel, there is a channel on river left which has a lock about .5 miles away. Do not take small channel on river right as it runs through a sluice to generate power. An alternative to waiting for the lock is to portage through Illini State Park on river left (but it's a long walk, over a mile depending on start). There is an easy to spot navigation dam with tall peaked bridge just past dam. 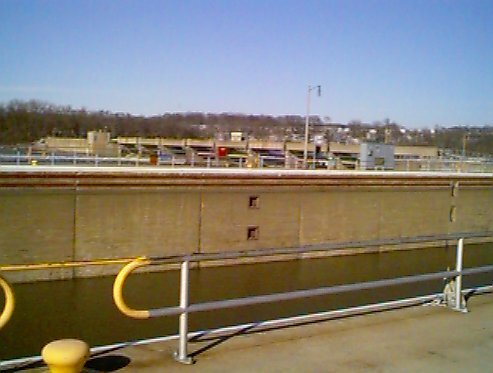 The lock is located in the Marseilles Canal on river left. An alternative to waiting for the lock would be to portage through Illini State Park on river left , but the banks are steep. 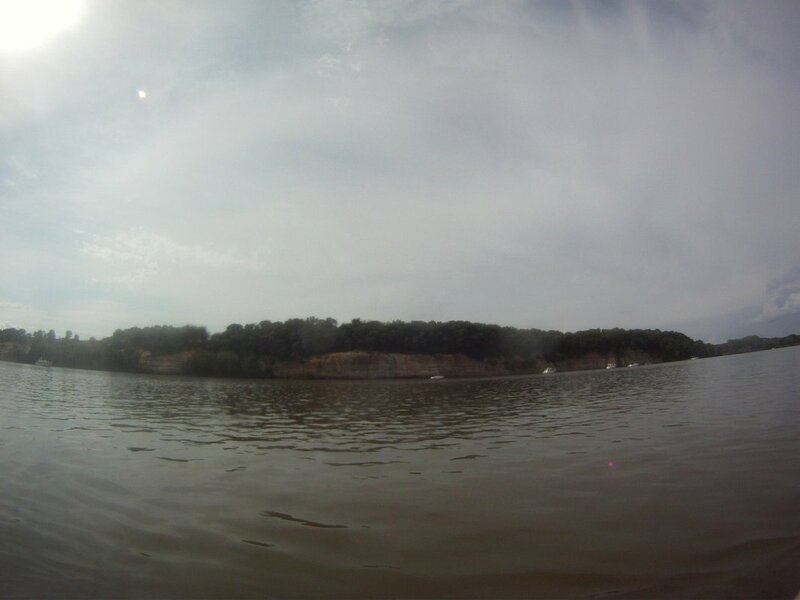 Easy to spot navigation dam with cliffs of Starved Rock on river left. Lock is river right. An alternative to waiting for the lock is to portage river right before the lock at Dee Bennett Road and portage down road for over half a mile.